Russia | Move Your "..BUT God .."
Heart pounding, I leaped up from the sofa, ran down the hall to my bedroom, and anxiously searched through my jewelry box. Where was it? I didn’t even remember the last time I’d worn it. Could I find it? Now was the moment, the divine instant. There in the corner, under pearls, gold earrings and an opal necklace, was a tiny, flat gray piece of barbed wire – now the most priceless jewelry I owned. Grasping it tightly I ran back to the living room. Leana looked at me with wonder that bordered on alarm. We’d met just nine days earlier. “She must be thinking ‘This is one crazy woman,’” I laughed to myself as I opened my hand and placed the small pin in hers. “This is yours,” I said, and my mind flew back over fifteen years as I began to explain to the confused young woman why I had flown from the room in the middle of her story. In my memory I could still clearly see the unimposing figure, a courageous man who carried Bibles into the Soviet Union. We listened with humility and admiration as he related how difficult life was for Christians living under the threat of persecution. For some reason I didn’t understand, his words kindled a passion in my heart for that land, and I bought a tiny barbed wire pin and wore it to remind me to pray for those people. Years passed, and as so often happens, I didn’t wear the pin as frequently. Eventually it drifted to the bottom of my jewelry box, but that didn’t quell the prompting I sensed from time to time to pray for someone. I didn’t know for whom I was praying, but I prayed God would protect, guide, bless, and be very real to her or him. Leana was one of four Russian girls our church was supporting in a college in the Midwest. Because the dorms were closed for two weeks over the Christmas break, the girls needed a place to stay. Tom, the youth director at our church, asked for host homes from the teens in the youth group. A year earlier our older son and a dozen youth had gone to Russia with Tom, taking medical supplies and an incubator to two hospitals in Moscow and St. Petersburg. Since our son loved his adventure in Russia, and since we had an extra bedroom, and even though we didn’t have a girl in the family, my husband, our two boys and I thought it would be fun to share our home and holidays with one of the Russian girls. Tom chose Leana for us, and her addition to our family made the holiday magical as we experienced our traditions anew through her eyes. With all four girls we went Christmas caroling up and down neighborhood streets, freely singing our faith. 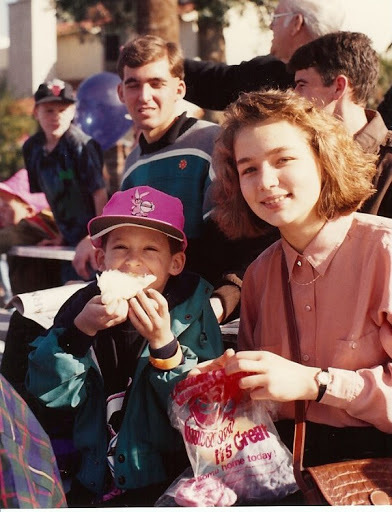 One Saturday Leana perched on bleachers beside our younger son and tasted her first cotton candy while flower-strewn floats and marching bands passed by in the first non-military parade she had ever seen. At the zoo she laughed delightedly as she swayed on her first camel ride. On Christmas Eve the candlelight flickered on her young face, reflecting the hope we felt rise more powerfully than ever with the strains of “Silent Night.” Our extended family showered her with gifts on Christmas Day, and Leana gave us beautiful gifts from her homeland. There had been so much activity that Leana and I hadn’t had much time to simply talk, so I seized the opportunity for some girl time with her while my husband and the boys were out one afternoon. Side-by-side on the sofa, I asked Leana about college, about her career dreams, about her family and her life in Russia, and about how she met Tom. That was it, simply matter-of-fact, but this sudden recognition launched my heart so jubilantly that I had to leap up and find the tiny pin. Now I knew whose it was. “This is yours, Leana. I’ve prayed for you for fifteen years, even though I didn’t know I was praying for you. God put you in my heart long ago!” Tears brimmed in her eyes and mingled with mine as we embraced and cried together. How is it possible to love someone you’ve never met? How is it possible to hear a child’s heart-cry and add your prayers to hers? How much more improbable is it to find yourself one day, in your own home, looking into the face of that same person? How breathtaking is it to be part of a miracle? I don’t think my prayers were the only ones God prompted for Leana, but how incredible it is to have played even a small role in the answer to her prayers! That to me is miraculous, and now I know it’s true that to be part of delivering a miracle for someone else is as astounding and life-changing as receiving a miracle of your own – perhaps even more so! A “. . . but . . .” to pray: Glroious God, I’ve prayed and sometimes not seen an answer to my prayers. It’s tempting at those times to think you don’t hear me, BUT I know you do, because Jesus told his disciples (and all of us, me included) to pray. You wouldn’t tell me to do pray if you didn’t passionately want to speak to me, hear from me, and move divinely in response to my prayers. Thank you that you inspire me to pray for others. I may never see or hear the results of my prayers, BUT I believe they will accomplish much more than I know. How wonderful if I could someday meet the one those prayers are for, BUT even if I can’t, thank you for giving my life incredible impact by making me part of a miracle, and thank you for moving someone I don’t know to pray for my needs. Your own “. . . but . . .” to pray: God, sometimes I think my prayers go no higher than the ceiling because I don’t see the answers, or because the answers are so long in coming, BUT I am willing to believe that ______________________________. Thank you for inspiring me to pray today for someone who needs a miracle.